Oil spills coat everything they touch and become unwelcome but long-term parts of every ecosystem they enter. When an oil slick from a large spill reaches a beach, oil coats and clings to every rock and grain of sand. If the oil washes into coastal marshes, mangrove forests, or other wetlands, fibrous plants and grasses absorb oil, which can damage plants and make the area unsuitable as wildlife habitat. 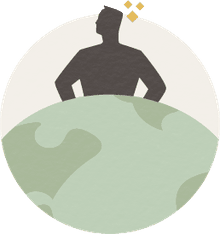 When oil eventually stops floating on the water's surface and begins to sink into the marine environment, it can have similar damaging effects on fragile underwater ecosystems, killing or contaminating fish and smaller organisms that are essential links in the global food chain. Despite massive clean-up efforts following the 1989 Exxon Valdez oil spill, for example, a 2007 study conducted by the National Oceanic and Atmospheric Administration (NOAA) found that 26,000 gallons of oil was still trapped in the sand along the Alaska shoreline. Scientists conducting the study determined that residual oil was declining at less than 4 percent annually. 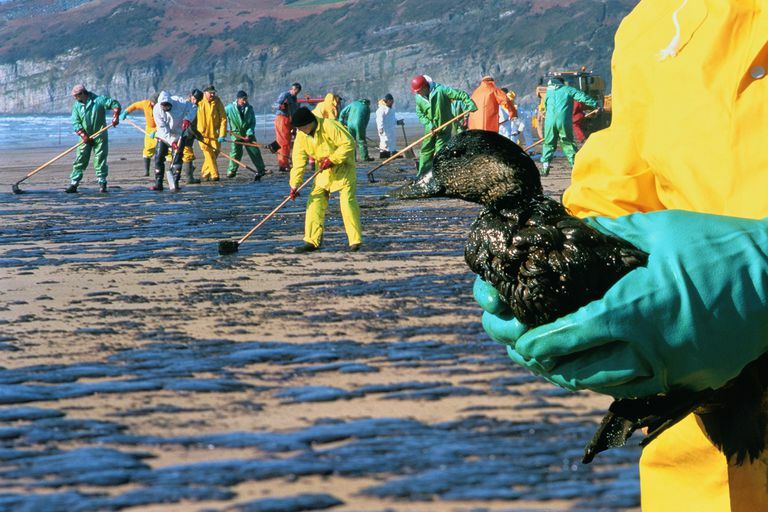 Oil-covered birds are a universal symbol of environmental damage wreaked by oil spills. Some species of shore birds might escape by relocating if they sense danger in time, but sea birds that swim and dive for their food are most likely to be covered in oil following a spill. Oil spills also damage nesting grounds, potentially causing serious long-term effects on entire species. The 2010 BP Deepwater Horizon offshore oil spill in the Gulf of Mexico, for example, occurred during prime mating and nesting season for many bird and marine species, and long-term environmental consequences of that spill won't be known for years. Oil spills can disrupt migratory patterns by contaminating areas where migrating birds normally stop. Even a small amount of oil can be deadly to a bird. By coating feathers, oil not only makes flying impossible but also destroys birds' natural waterproofing and insulation, leaving them vulnerable to hypothermia or overheating. As birds frantically preen their feathers to restore their natural protections, they often swallow oil, which can severely damage their internal organs and lead to death. The Exxon Valdez oil spill killed from 250,000 to 500,000 seabirds, plus shore birds and bald eagles. Oil spills frequently kill marine mammals such as whales, dolphins, seals, and sea otters. Oil can clog blowholes of whales and dolphins, making it impossible for them to breathe properly and disrupting their ability to communicate. Oil coats fur of otters and seals, leaving them vulnerable to hypothermia. Even when marine mammals escape the immediate effects, an oil spill can contaminate their food supply. Marine mammals that eat fish or other food exposed to an oil spill may be poisoned by oil and die or experience other problems. The Exxon Valdez oil spill killed thousands of sea otters, hundreds of harbor seals, roughly two dozen killer whales, and a dozen or more river otters. In the years after the Exxon Valdez spill, scientists noted higher death rates among sea otters and other species affected by the spill and stunted growth or other damage among additional species. Oil spills often take a deadly toll on fish, shellfish, and other marine life, particularly if many fish eggs or larvae are exposed to oil. Shrimp and oyster fisheries along the Louisiana coast were among early casualties of the BP Deepwater Horizon oil spill. Similarly, the Exxon Valdez spill destroyed billions of salmon and herring eggs. Years later those fisheries had not recovered. Long-term damage to species and their habitats and nesting or breeding grounds is one of the most far-reaching environmental effects caused by oil spills. Even species that spend most of their lives at sea, such as various species of sea turtles, must come ashore to nest. Sea turtles can be harmed by oil they encounter in the water or on the beach where they lay their eggs, their eggs can be damaged by oil and fail to develop properly, and newly hatched turtles may be oiled as they scurry toward the ocean across an oily beach. Ultimately, the severity of environmental damage caused by an oil spill depends on many factors, including the amount of oil spilled, type and weight of oil, location of the spill, species of wildlife in the area, timing of breeding cycles and seasonal migrations, and even the weather at sea during and after the oil spill.